La’Donna B. is an independent licensed makeup artist based out of Baltimore, MD. She began freelancing with CosPro early 2013 and has already done many events. 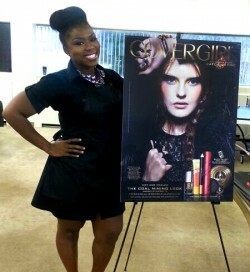 Most recently she represented CoverGirl at their corporate office performing makeovers inspired by the new Hunger Games film with their Capital Beauty Collection. In 2003, she entered the world of makeup artistry by creating faces for locals. In 2007, she received her cosmetic license from Von Lee School of Aesthetics and was fortunate enough to receive special training from several celebrity makeup artists. With her license she immediately procured a variety of jobs ranging from a cosmetic counter specialist to lead makeup artist of indie films. She has been featured as the Key Makeup Artist for several music videos and many special events including The Ultimate Makeover Show and Baltimore Fashion Week! She provides her services for many photographers and has even assisted Oprah’s personal makeup artist, Reggie Wells. She is currently working on opening a boutique and releasing her cosmetic line LDB Cosmetics.